What is the difference between Color and Colour? Both words have the same meaning. You can see a difference in spelling. One word has OR and the other word has OUR. The spelling depends on the country where the word is written. Color is used in American English. Colour (with the letter U) is used in British English. This difference of OR in American English and OUR in British English also appears in some other words. When you use these words together, make sure they are both in the American English form (without a U) or both in the British English form (with the letter U). This is how it is written in American English… no letter U. This is how it is written in British English… both with the letter U.
Don’t mix them when writing. 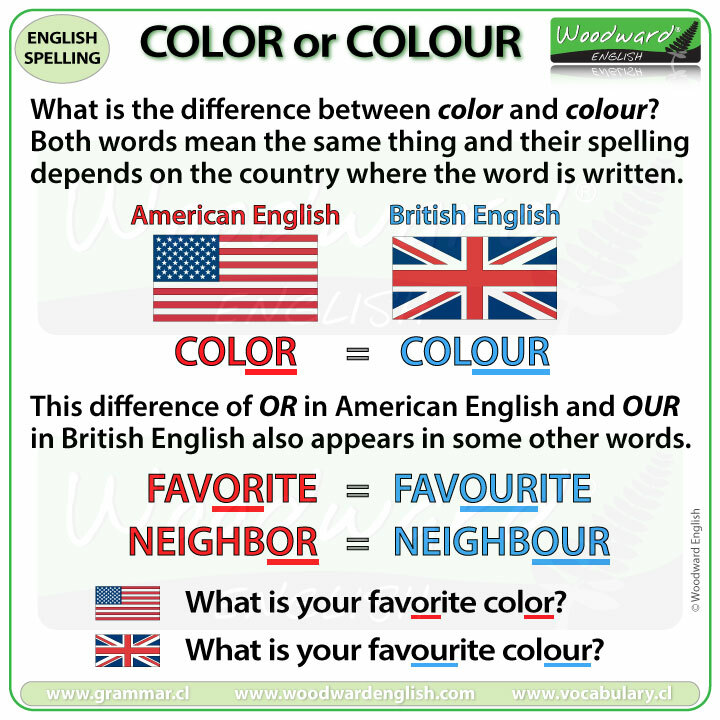 This example is NOT correct because favorite is in American English and colour is in British English. You cannot mix styles.